Honey bees practice ‘flower fidelity’ as they only visit one type of flower with each trip from the hive. This is awesome for pollination! She (all honey bee workers are sterile females) lands on a flower and begins to moisten the dry pollen with her mouth using nectar carried from the hive in one of her two stomachs. Each pollen granule has between four and ten million grains of pollen. Next, the moistened pollen is packed into the “pollen baskets”, the corbiculae (stiff hairs), of her hind legs. Typically, dry pollen particles stick to the worker bee’s body and catch a ride to the next flower. In this manner pollination occurs as the bee lands on flower after flower. Pollen is used to feed baby worker bees and is the only protein source for the honey bee colony. The pollen that is stored during the warm months are used during late winter/early spring to feed the first brood (baby bees) that are hatched out after a long winter. Without enough pollen during this critical time, whole colonies of bees can die from starvation even if there are adequate stores of honey. As a popular energy-enhancing nutritional supplement, pollen is not only high in protein, a complete protein as it contains all the essential and even most non-essential amino acids. Also, this protein has been predigested by the bees so it is very easy for the body to digest and assimilate. There are also vitamins, minerals, and trace minerals, however, the quantity of bioavailable Vitamin B12 varies greatly by location and should not be assumed to be in high enough quantity for a human. Note: Rutin is a powerfully antioxidant bioflavinoid that helps the body produce collagen and utilize Vitamin C.
“Pollen is a good source of enzymes and co-enzymes [over 5,000 different types of live enzymes have been identified] and also has the highest anti-oxidant activity, as measured by the ORAC index, of any fruit or vegetable. Because of its nutrient density, one to two teaspoons of pollen is equivalent to a serving of vegetables. Therefore, supplementing your diet with bee pollen is a great way to significantly improve your nutrient intake.”3 This being said, pollen does not contain the correct proportion of nutrients required by humans to use as a sole food source for an extended period of time. 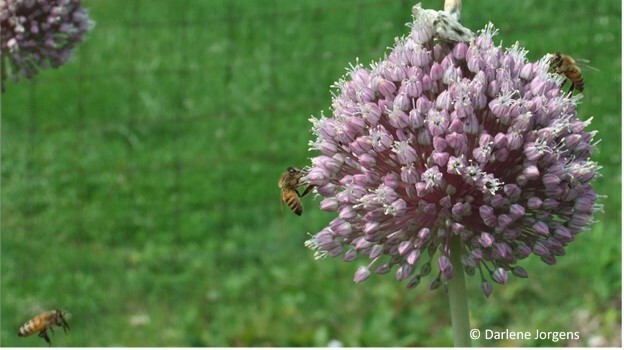 Thus, while it is beneficial as a supplement, it remains only the “perfect food” for bees! Pollen is a wonderful “blood-builder” as it decreases the oxidation of both red and white blood cells and increases hemoglobin. Not long ago, a client contacted me for a recommendation on a horse diagnosed with anemia. After only two weeks on pollen the mare was feeling well enough to show again (with a double pollen dose the morning of the event for a little extra energy.) She performed great for her owners. When I followed up, the trainer exclaimed that the pollen worked great and that after the first couple of days the horse’s allergies went away too. Pollen was the best choice. It gives one cause to wonder if pollen’s ability to build healthy blood might actually be a greater contributor to the lessening of seasonal allergies and hay fever than the “immunizing” effect it is theorized to have. Most people are allergic to wind-borne pollens such as grasses, while the pollens that honey bees collect are not of the wind-borne type, rather, they are from plants that require insect pollinators. “There is a rapidly increasing body of scientific evidence which shows that pollen has a variety of anti-inflammatory, anti-cancer, and anti-arthritic properties. Its anti-inflammatory and antiallergic properties, as well as its immune system normalizing phytochemicals, allows bee pollen to be used therapeutically to decrease symptoms in people who have hay fever and pollen sensitivities. This is done through oral administration and is analogous to the way allergists treat people with desensitization injections. The therapy consists of giving a patient tiny amounts of a substance that a person is allergic to, and slowly increasing the amount over time. Pollen has been reported to be useful in many other medical conditions including: varicose veins, high cholesterol and triglycerides, fatigue, infertility, impotence, anorexia, obesity, constipation, diarrhea, hypertension, prostatitis, depression, scar formation, and recovery from illness and surgery. 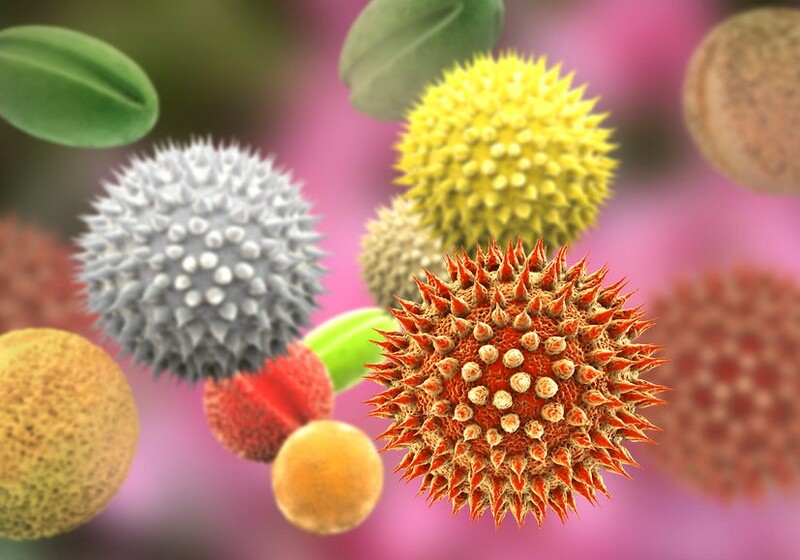 Pollen is compatible with other therapies, it can be used long term, has no toxicity even at high doses for those who are not sensitive or allergic, and is safe to take as a supplement during pregnancy.”3 In fact, one of the most important use of pollen is for its curative activity in prostate disorders. If you’ve never taken bee pollen granules before, test your tolerance with a small amount and work up slowly to a full daily dose. Should you experience mild allergic symptoms such as runny nose, itchy throat, mild headache, sweating, tearing of the eyes, stomach or bowel distress, or respiratory issues, stop taking pollen for a few days, then start again at the lowest dose that does not cause symptoms. 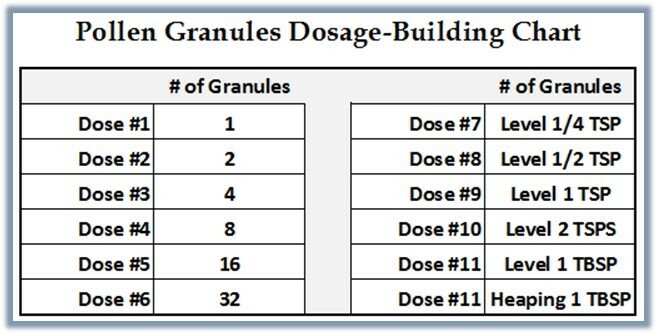 Stay at that dose for an entire week this time, then build up slowly, increasing only one dose per week perhaps. Do not rush this process. Take as long as you need. If you have a severe reaction, please contact a health professional before taking pollen again in this manner. If you experience anaphylaxis immediately dial 911 and discontinue pollen use altogether. Warning: Do not begin taking pollen during the time you are pregnant or breastfeeding. Bee pollen can interact with warfarin and other blood thinners so anyone taking these medications is advised to consult with their physician before ingesting honey bee pollen. Note: Keep pollen granules refrigerated. Freeze for long-term storage. Bee pollen does not freeze so it can be eaten directly from freezer. Do not leave unrefrigerated for extended periods of time. Pollen can be consumed by itself or with food. It can be sprinkled on a salad or oatmeal that has cooled a bit, mixed right into salad dressing, yogurt, and smoothie, whatever you like. I add pollen into a chia/gelatin/cinnamon/almond milk “pudding” that I make. Just remember not to put it on foods that have not cooled to near 104 degrees. Heat causes a rapid degradation of nutrients and enzymes. Pollen is even delicious plain (just how the bees eat it) at around room temperature. Does bee pollen need to be soaked because each pollen grain corpuscle is encased in a protective barrier to protect the male seed from UV rays and the elements? Well, yes and no. While there is a doctor who is claims to have studied this and found that absorption was increased dramatically (from 7-12% to +-90%)11 by soaking the pollen overnight for 12 hours. This research is not presently available and there seems to be an unfortunate lack corroborating research. In spite of this, you might consider soaking bee pollen if you are not getting the results you desire such as increased energy and vitality. Anyone with known digestive disorders such as Crohn’s, ulcerative colitis, IBS, bloating, etc., may want to consider soaking their pollen. I enjoy putting my daily dose of pollen in a little glass of almond milk. Within about 30 minutes most of the pollen has dissolved and I have a thicker, slightly sweet yellow/orange “pollen milk” that I enjoy. Bee creative and comment about ways you like to eat pollen below!